Editor’s Note: This feature is part of The Inertia‘s Health and Wellness Spotlight, an initiative that explores emerging trends in nutrition, diet, and fitness in surf and outdoor culture. We’ll be releasing a feature each day this week with your health in mind, so check back here daily. Unequivocally, excellent health enables more time to fully enjoy the ocean and outdoors. This initiative is powered by our friends at Vivobarefoot. Check out The Inertia’s 2019 Health and Wellness Product Guide here. 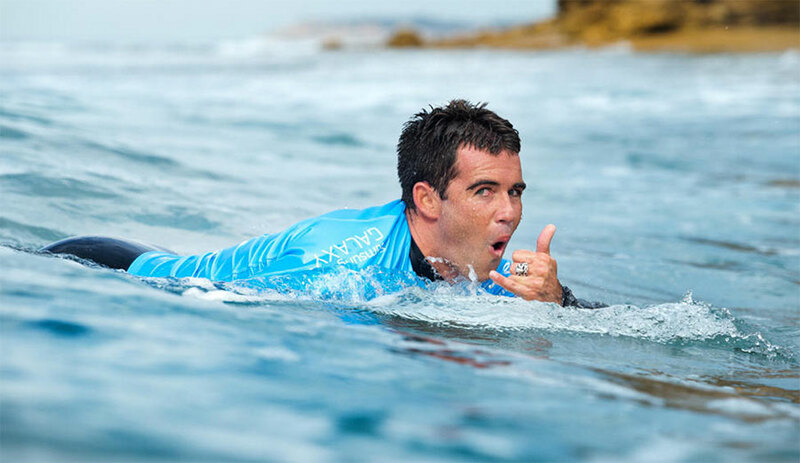 Over a year ago, Mason Ho jumped in the commentary booth with “The Other Guys” – a Red Bull simulcast during the 2018 Volcom Pipe Pro – for a conversation that can only be described as frenetic. In typical Mason fashion, banter jumped from the Mohawk he sported earlier in the year to talk of his enthusiastic hand gestures during interviews he has little control over. But, mixed in the word soup was a flashing mention of a recovery product – a form of organic advertising the likes of which the brand behind the product could have only dreamt of. Granted, Mason Ho is no stranger to superlatives. His comments, though, hinted at a broader health trend that heralds the virtues of CBD as a cure-all for a variety of ailments. It’s swept up many a professional surfer and outdoor athlete (not to mention mainstream athletes like the NFL’s Derrick Morgan). But, the question remains: is CBD legit? Cannabidiol (aka CBD) is widely available in consumer products that profess to have a number of health benefits: from relaxation to muscle recovery, chronic pain treatment to gut health. And many athletes looking for holistic remedies for aches and pains from the immense stress they put on their bodies are turning to CBD and away from dangerous pain meds and other pharmaceuticals. According to researchers, the power of CBD and cannabinoids is promising, but clinical studies have yet to catch up to CBD’s current uses. Not to mention Federal Drug Administration regulations bar CBD companies from making specific claims about using products to treat ailments, and companies are wishy-washy on specific dosage. The lack of oversight has also created an issue where in one study a little over one-third of CBD products were accurately labeled, making it difficult for consumers to know which brands to trust. To understand the purported health effects of CBD, it’s important first to understand what CBD is. Cannabidiol is one of over 100 identified cannabinoids found in cannabis plants. Unlike Tetrahydrocannabinol (THC), the primary psychoactive compound in weed that gets you high, CBD is non-psychoactive. The compound first rose to prominence in 2013 when Colorado pot growers, the Stanley Brothers, developed a strain of cannabis high in CBD and low in THC. It gained national attention when Matt and Paige Figi were searching for a treatment for their daughter Charlotte’s myoclonic epilepsy of infancy (SMEI), and the cannabis strain, later called Charlotte’s Web, was the only treatment offering Charlotte relief. That laid the foundation for research and clinical trials. In June of 2018, the FDA approved its first CBD drug ever, Epidiolex, for the treatment of rare forms of epilepsy. 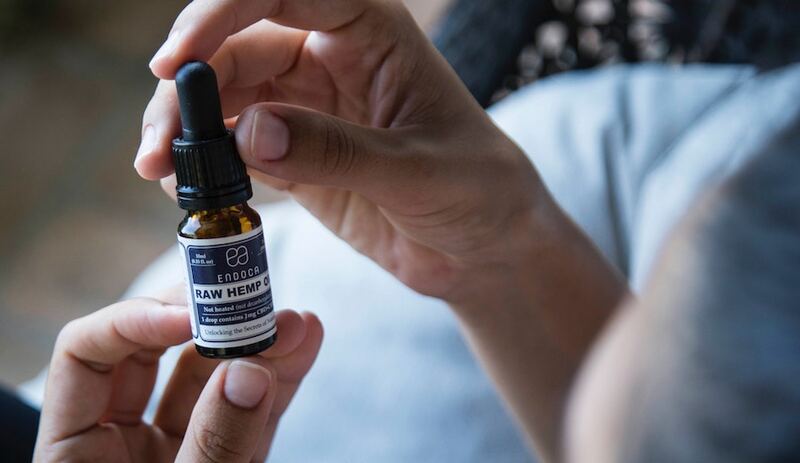 In the past six years, CBD has become a full-blown holistic health trend and can be found in a variety of products from tinctures to rubs to beer to ice cream. According to Jenny Wilkerson, an associate professor of pharmacodynamics at the University of Florida, CBD binds to interact with serotonin receptors as well as a few other types of receptors in the brain, just not the cannabinoid receptors that get you high. Wilkerson argues that one of the challenges for consumers and researchers alike is that because CBD is a natural compound it’s very difficult to isolate. As such, most hemp-derived CBD or marijuana-derived CBD probably has other cannabinoids present, making it difficult to get a clear picture of the effects of CBD on treating different ailments. Remember Mason Ho’s Elixicure plug? Well, Mason jumped ship earlier this year and is now on the roster for NanoCraft CBD. But, head to Elixicure’s website and you’ll find a carousel of endorsements including one from Mason’s sis, Coco, who says she likes the lavender blend for muscle soreness and relaxing. Brett Simpson is an official ambassador, too. Eli Olson rounds out Nanocraft’s surf team. Kassia Meador reps Ojai Energetics, Billy Kemper is an ambassador for EcoSciences, and Koa Smith rides for MedTerra. But how did these surfers first get introduced to CBD, and what are they using it for? For both Meador and Kemper, they first learned about CBD while searching for holistic treatment alternatives for their parents – Kemper’s mother sadly passed away from throat cancer last March, and Meador’s mom has multiple sclerosis. “I was looking into alternative supportive natural supplements for [my mom] to take that would help curb the MS symptoms,” Meador explained in an email. The effects were convincing, and now she regularly uses different products from Ojai Energetics’ lineup. “They have an elixir I take every night. Their spots cream I use when I have an injury or sore muscle, and I love their coconut oil both in my coffee/tea in the morning and in the bathtub with some Epsom salt,” she said. In the years since she’s incorporated CBD products into her life, Kassia told us she’s had positive results with recovery, sleep, and focus. “The elixir helps me sleep, combat jet lag if I have it, helps my body recover from training and surfing, and is also good in helping neurological function and in stripping the plaque from my brain as I’ve had many severe concussions in recent years,” she said. 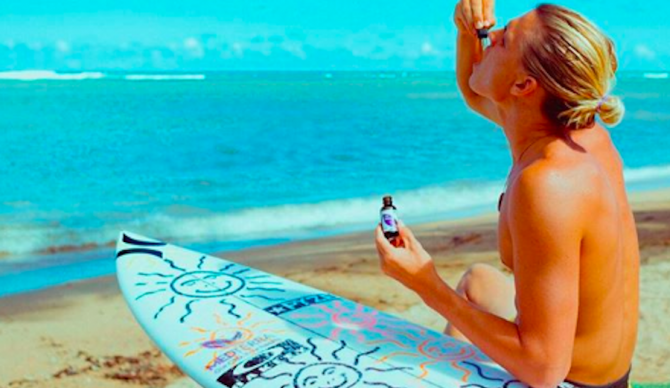 Kemper, Mason and Coco Ho, and Smith all echo the benefits of CBD. “CBD has made short acute little injuries almost non-existent!! Keeps me feeling young and ready!” explained Mason for Nanocraft CBD’s blog. And it isn’t just surfing that’s jumped on the CBD bandwagon. Competitive climber Lisa Chulich endorses CBD products for the anti-inflammatory benefits, heart health, insomnia treatment, and for reducing anxiety and depression. “As a climber, I use [CBD] salve on my finger joints/tendons after brutal days climbing and finger training to reduce some of the stress there without sending anti-inflammatory signals to my entire body,” writes Chulich for her blog. Until very recently one of the primary concerns among athletes interested in CBD has been legality, at least in the United States. But late last year, Congress passed the Agriculture Improvement Act of 2018 that removed hemp from the Controlled Substances Act, decriminalizing hemp-derived CBD products. According to the FDA, though, it is unlawful to market hemp-derived CBD products as therapeutic or dietary supplements before the FDA has been able to validate such claims. Also, marijuana-derived CBD remains federally illegal, but last September saw further progress as the Drug Enforcement Agency moved CBD from its Schedule I list of controlled substances to Schedule V. So if you’re a recreational marijuana-derived CBD enthusiast, its legality may depend on the state in which you reside. For sports leagues, many (including the World Surf League) allow for CBD use per the guidance of the World Anti-Doping Agency. Point being: government regulations and governing bodies of professional sports continue to become more lenient on CBD. In one of the most comprehensive studies to date on the health impacts of cannabis and cannabinoids, researchers from the National Academies of Sciences, Engineering, and Medicine concluded that certain cannabinoids are effective in the treatment of chronic pain in adults, especially those with multiple sclerosis-related symptoms or chemotherapy-induced nausea and vomiting. According to Wilkerson, though, in spite of anecdotal evidence indicating the positive effects of CBD products for treating injuries and for muscle recovery, the science doesn’t quite support the claims many athletes are making. At least not yet. But that doesn’t mean researchers aren’t looking into it. “More than likely by this time next year there will be several publications about that,” said Wilkerson. While objective, scientific claims around CBD’s efficacy beyond those involving chronic pain and a handful of symptoms might be premature, it’s certainly possible they’re coming. One of the most promising areas of research for CBD at present is its potential as a sleep aid and for drug addiction intervention. “CBD does pre-clinically seem to have relevance for better sleep… and help with drug addiction-related issues,” said Wilkerson. One of the key problems for consumers is that because CBD products are marketed as supplements and not medication, manufacturers are prohibited by the FDA to specifically address what CBD can and should be used for. And again, beyond those restrictions, the industry itself lacks oversight. A 2017 study found that of the products researchers tested, only 31 percent accurately reflected their contents, and THC was detected in over 20 percent of the contents. That poses problems for consumer confidence and brands seeking to operate transparently in the market. It’s also important to be leary of regulations that vary by state. Hemp-derived CBD is now federally legal, but marijuana-derived CBD is more complicated. Idaho, South Dakota, and Nebraska, for instance, all outlaw any and all marijuana-derived products. For Wilkerson, her advice to consumers is to do your research. Editor’s Note: This feature is part of The Inertia‘s Health and Wellness Spotlight, an initiative that explores emerging trends in nutrition, diet, and fitness in surf and outdoor culture powered by our friends at Vivobarefoot. We’ll be releasing a feature each day this week with your health in mind, so check back here daily.